Allyn Cox Oil on Canvas 1973-1974 Great Experiment Hall Cox Corridors At his inaugural on the steps of the newly completed Capitol, Lincoln expressed his hopes for reconstruction of the Union after the Civil War. He urged moderation, humility, and humanity in dealings with the South. 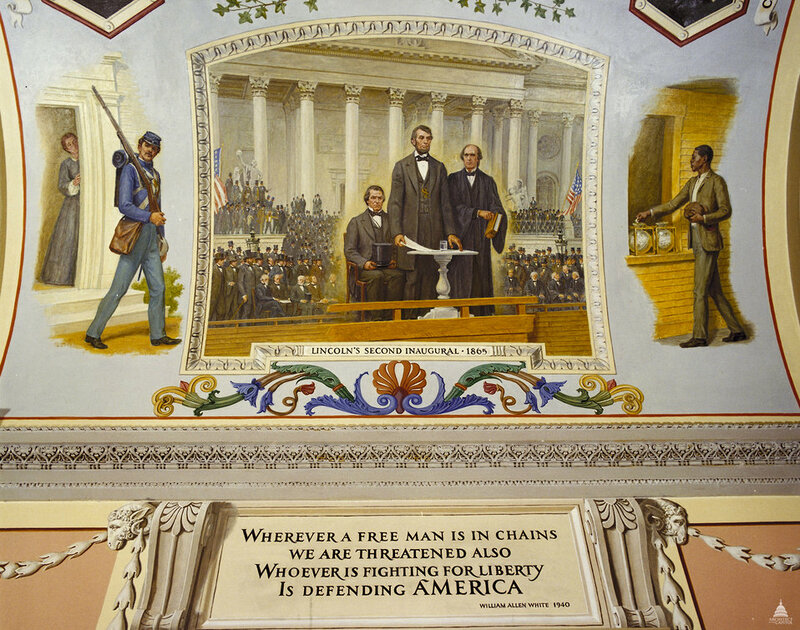 Shown in the center of the scene (from left to right) are Vice President Andrew Johnson, President Lincoln, and Chief Justice Salmon P. Chase. Left: The soldier symbolizes the nation reunited. Right: An emancipated African American casts a vote, symbolizing the extension of this basic right to all male citizens by the Fifteenth Amendment to the Constitution, regardless of 'race, color, or previous condition of servitude.' This official Architect of the Capitol photograph is being made available for educational, scholarly, news or personal purposes (not advertising or any other commercial use). When any of these images is used the photographic credit line should read âArchitect of the Capitol.â These images may not be used in any way that would imply endorsement by the Architect of the Capitol or the United States Congress of a product, service or point of view. For more information visit www.aoc.gov.